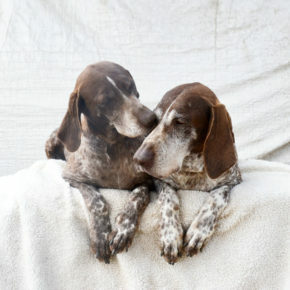 Two senior dogs are homeless after their former family decided to surrender them because the grand kids were no longer interested…Coco and Spotto, German Shorthaired Pointers, are looking for a new home together at 11 years of age. She tells us they do everything together – from eating, to sleeping, to potty! Spring often comments on how hilarious they are and is discovering their individual personalities, too. Coco is a bit more demanding of attention, and Spotto is more laid back. 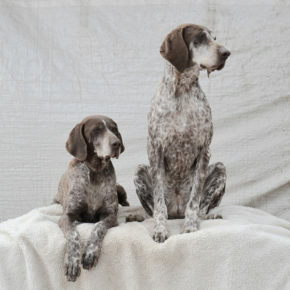 They are doing well with her own GSP, and can be found lounging on the same bed with him from time to time. As with most GSPs, Coco and Spotto have no concept of “personal space”, and love being near Spring and her dog Baggins. We aren’t sure how much time they spent in a house before, but they’ve fully embraced it, have learned the dog door, and Spring is working on leaving them home alone in small increments. You can help Coco and Spotto find a home together by sharing this article with their adoption information. Link to the rescue organization’s adoption profile for Coco and Spotto here (including link to adoption application). Rescue group on Facebook here. Yesterday in the news: Coco – depressed and hopeless after being given up by family – more here. More news: Man arrested for beating dog –more here. What adorable dogs and being so devoted to each other can be a plus for an owner when you have to go out and leave them alone. Hopefully they would have each other to comfort if they felt any anxiety. Please someone seriously consider adopting both bonded dogs. You will be blessed. You are so right and I feel the same way. Subhumans make me sick to death enough to make me want to choke the hell out of them. Prayers and blessings for this beautiful pair! Oh, so now the grandkids get a say in how long you love your dogs? Really, this is pathetic – how did they know the grandkids would ever be interested? Did they get the dogs just to entertain the grandkids? Ridiculous, maybe they should have rethought throwing the grandkids aside instead – it’s no worse than throwing away the dogs, because they’re family just the same, or supposed to be. I commented in a previous report on thinking there’s been a mutation happening away from humanity in the human race, well we keep gathering more evidence every report. Moronic lowlifes don’t deserve dogs or grandkids. So heartbreaking! I have two dogs and wish I could take these two. They make good family dogs. Anyone that can give up their dogs like this is as low as you can go! Hope someone can take the two and give them a chance to adjust. VERY SAD! Check out this link I found, posted on the rescue group site. Adopted together thank goodness.